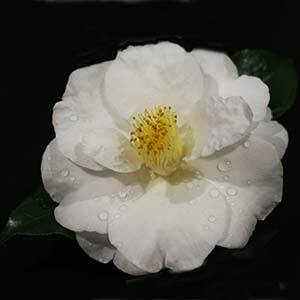 Very popular in gardens with a little shade, white flowering camellia varieties come in both Japonica and Sasanqua types. 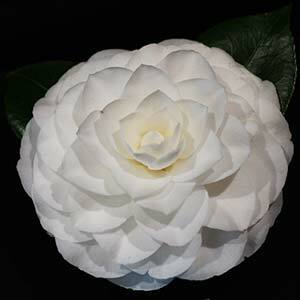 The white flowers not only look great they also add a lift to darker areas, with great contrast against the darker foliage of the camellia plant. Flowers range from simple singles to formal doubles and semi doubles, some with fimbriated petals. 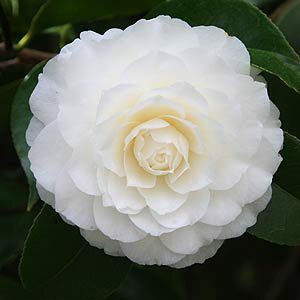 If you are looking for a long flowering plant to add a touch of lightness to a shaded area in winter then one of the white flowering camellia varieties could well be the answer. A very old variety with fully double medium sized flowers. Semi double with large anemone flowers. Fast growing and ideal for a hedge or screen. An old fashioned Australian variety, still an award winner at camellia shows. This is a formal Double variety with a good upright growth habit. Will flower early from May onwards. Lovely pure white flowers from autumn through winter from this fast growing, drought tolerant easy care Camellia sasanqua. A fast growing formal white flowering variety. Good upright habit and a vigorous grower. An interesting white flowering species not often offered for sale. White, large double centre, spreading, bushy. Large semi double flowers and a very clean white. Upright habit and grows well in shade.